‘I lived in a fantasy world and was on the way to becoming an incurable daydreamer’ (German = ‘Ich lebte ganz meinen Phantasien und war auf dem Wege, ein ganz unheilbarer Schwärmer zu werden’), wrote the Saxon poet Ernst Schulze (1789-1817) of his schooldays. Despite this moment of clarity, Schulze did indeed live in a world in which the boundaries between the real and the imagined were increasingly hazy. As a student in Göttingen he shared Don Giovanni’s ‘mille tre’ attitude to women, notching up a string of casual conquests while pursuing the daughter of an archaeology professor, Cäcilie Tychsen. Schulze’s campaign to seduce Cäcilie failed; and when she died of tuberculosis, aged just eighteen, in 1812, she became idealised as his lost bride- to-be, saviour and Muse. Conveniently for the fantasising poet, Cäcilie had a sister, Adelheid, to whom he quickly transferred his affections. That Schulze had earlier described Adelheid as having ‘a monkey’s face’ (‘Affengesicht’) did not seem to matter one iota. Nor did the fact that Adelheid was in love with someone else. From 1813 until his own early death, likewise of tuberculosis, Schulze embroidered his fragmentary, largely one-sided relationship with the reluctant Adelheid in the 100 poems that make up his Poetisches Tagebuch (‘Verse Journal’). Schubert first seems to have alighted on Schulze’s work in 1824, when he flirted with the idea of making an opera from his long narrative poem Die bezauberte Rose (‘The enchanted Rose). Then in March 1825 he set ‘Im Walde’ from the Poetisches Tagebuch, initiating a sequence of Schulze songs composed over the following year. 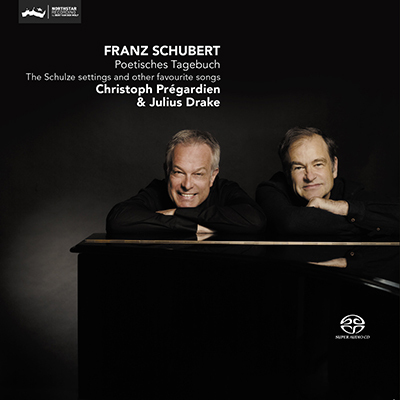 While only two, ‘Auf der Bruck’ and ‘Im Frühling’, have become recital favourites, these songs of loss, alienation and obsessive longing (Winterreise is already glimpsed) are among Schubert’s most powerful and poignant.